A blog post from Eleanor Dickey. Above: A Roman relief from Trier showing part of an ancient school, and Below: Reading’s Emma Aston modelling a costume based on that relief. On November 19th the department will be hosting an ‘Experiencing Ancient Education’ event, in which local children will have the opportunity to find out first-hand what an ancient school was like. This day is part of the Being Human Festival of the Humanities, a new initiative aiming to bring cutting-edge Humanities research to the general public in novel and interesting ways. The festival includes many other exciting events, including some others at Reading; you can find the full programme at http://beinghumanfestival.org/. Our event builds on recent work on ancient textbooks that describe a day in the life of schoolchildren; these textbooks have recently been translated into English for the first time (http://www.cambridge.org/gb/academic/subjects/classical-studies/classical-languages/colloquia-hermeneumata-pseudodositheana-volume-1) by Reading’s Eleanor Dickey. We are gathering a set of Roman costumes along with wax tablets, styluses, reed pens, ostraca, papyrus, windows looking out on the Nile, and all the other accoutrements necessary to create an authentic atmosphere in what is usually the Resources Room. Lecturers and students from the department are learning about ancient teaching methods (no raised hands and no note-taking — how will we cope?) in preparation for guiding participants through a set of ancient-style school exercises. We are confident that the experience awaiting our participants will be unique in modern times — though with great regret we have decided not to use that stereotypical tool of the ancient classroom, the whip. Several other activities are planned to accompany the event: the Classics Kitchen will be selling authentic Roman food and explaining how it is prepared, the Ure museum will be offering a special look at its collections, and we hope also to have a demonstration on how to make ancient writing equipment. Bookings are almost full, but some tickets are still available; these are free but need to be reserved as the Resources Room has a finite capacity. You can reserve a place at http://beinghumanfestival.org/event/experiencing-ancient-education/. 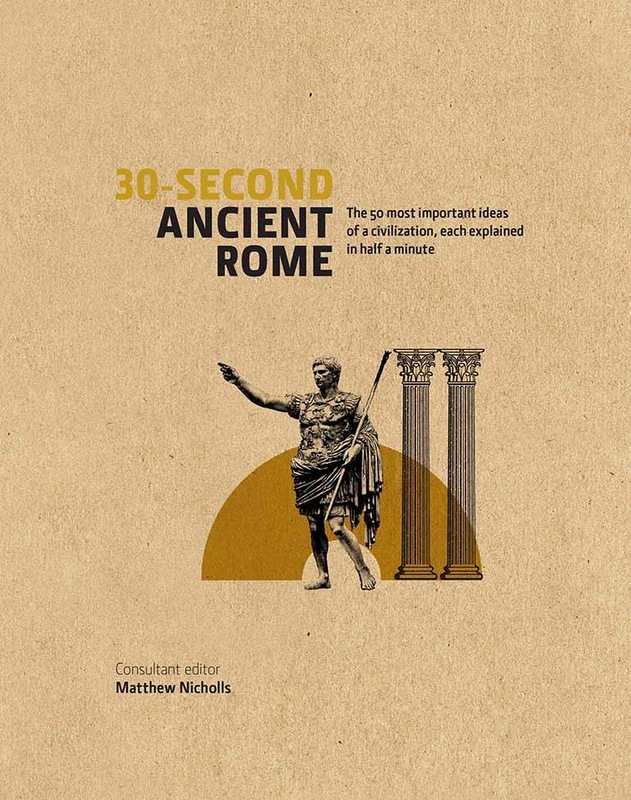 I’m delighted to announce the publication of ‘30-second ancient Rome’, a compact guide to fifty of the most important topics and people in ancient Roman history. This has been published as a handsome (but inexpensive) hardback by Ivy Press, and should, I hope, be of interest to anyone who wants to know a bit more about the Romans. Putting the book together was a really enjoyable process. The format was set by the press, who have a whole series of these 30-second guides – my Rome book takes its place alongside introductions to architecture, mythology, anatomy, and so on, each following the same template (though strangely J.R.R. Tolkein was upgraded to a ‘three-minute guide’ – there are some things that resist simplification; happily the entirety of Roman history is not one of them). My first task was to choose the fifty entries. As our third-year dissertation students will know, the challenge in such an exercise is not what to put in, but what to leave out. Some topics were obvious enough, and the Press was understandably keen to see, for instance, entries on the legions and gladiatorial combat. For my part, I wanted the book to reflect something of the breadth of approach that a Classics department like ours brings to the study of an entire civilisation: one of the attractions of Classics as a subject is the chance to combine literary, historical, archaeological and other material. I also wanted the book to surprise or intrigue its readers as well as covering more familiar ground. As the format called for seven chapters, I decided to group material into broad categories: a more or less chronologically organised opening chapter on the foundation and growth of Rome; chapters on social history and daily life topics; a section on language and literature and another on religion; and finally two chapters about art, architecture, monuments, and technology. Each chapter also includes a biography of a figure of particular relevance. Resisting the temptation to include the biography of Augustus in every chapter, I had fun thinking of suitable individuals. Gradually the list of topics took shape, and then I had the enjoyable task of asking colleagues who are experts in each field to write the entries with me. With the honourable exception of Ailsa Hunt in Cambridge who kindly wrote the whole religion chapter, I was able to find current, past, and even (by an act of prescience) one future Reading colleague to share their wide-ranging expertise, so you will find entries by Susanne Turner, Dunstan Lowe, Peter Kruschwitz, Annalisa Marzano, and Luke Houghton. I wrote most of the entries myself, though, and in doing so enjoyed the unusual discipline of writing for a general audience to a very tightly-controlled word count. The series is called the 30-second guides as the main entry on each page is meant to take no longer than that to read. This is a very different sort of writing to normal academic prose, which is statelier in its pace and rich in footnotes and detail; I found that it required real care to compress the maximum number of facts into a short compass, and writing in this way was an agreeable technical challenge. Classics students – and those with a taste for sub-par Oliver Stone movies – will know that Alexander the Great campaigned as far as the very edges of the world as known to the ancient Greeks, in Afghanistan and India. A story which is less well know is that of the military colonists he left behind. Greek and Macedonian soldiers were settled in remote garrisons, as well as ancient cities such as Samarkand and Bactra. For almost three hundred years, the descendants of these soldiers ruled as kings in Central Asia and India, minting coins with Greek legends. Like many of our current third-year dissertation students, I found that unanswered questions from my undergraduate studies made for a great research project. What happened at the ‘fringes’ of the ancient world? How did Greek settlers interact with local populations? In areas where few ancient written sources survive, what other forms of evidence can we employ in historical research? Why have ancient Greek olive oil jars been excavated in Afghanistan? 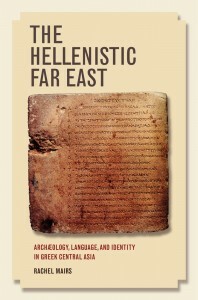 My new book The Hellenistic Far East: Archaeology, Language and Identity in Greek Central Asia has just been published by University of California Press. It presents exciting, and little known, textual and archaeological material from Central Asia and India in the period after Alexander the Great. Through this evidence, we can explore a complex, multiethnic, multilingual society in the contact zone between Greek and ‘barbarian’, settled and nomad, East and West.For those interested in finding out more, the Hellenistic Far East blog (www.bactria.org) has regularly updated bibliographical essays.